Royal City athlete, Kinsey Weir, competed in the BC Summer Games in mid July and took home a silver medal in the pole vault with a personal best performance of 2.50m. She also placed eighth in the javelin with a personal best throw of 24.69m. It was only the third meet that Kinsey had ever thrown the javelin. Three Royal City athletes competed in the BC Athletics’ midget to senior track and field jamboree in Coquitlam from July 13th to 15th. Kinsey Weir competed in a full slate of events including long jump, high jump, triple jump, pole vault and javelin. She placed 5th in javelin, 4th in triple, and 3rd in pole vault, her specialty. Courtenay Vanee joined Kinsey in the javelin and placed sixth. Richard Wang placed 5th in the 2,000m run. Royal City athletes competed in the 2012 Trevor Craven Memorial Track & Field Meet on July 7th and 8th. 10 year old Megan Lauener ran the 60m hurdles in a blistering time of 10.99 seconds to meet the BC JD Award Standard – only 5 milliseconds out of the top 10 of all time! She also won the 600m race and a silver medal in the 100m. Sibling James Lauener also did well in the hurdles for 13 year olds winning a bronze medal. He equaled the performance in the javelin with another bronze medal. Also of note was the medal haul by Maxwell Jones across all disciplines with a gold medal in the 60m, silver medals in high jump, long jump, and javelin, and a bronze in the 200m. Without question, Max dominated the 11 year old boys at this meet. Other medals went to 11 year old Anaiyah Bernier with a 3rd in the 60m and 100m races. Also among the younger girls winning medals was Michelle Dadson with a surprising gold medal in the discus throw. The Dadson family also won bronze medals in the 12 year old boys’ 200m and high jump with Emmanuel, Michelle’s older brother. Thrower, Jeneviève Patry-Smith picked up more medals with a silver in the 11 year old javelin and a bronze in shot put. The 11 year old’s showed their strength also with Ryan Jensen picking up a silver in the 800m race walk and two bronze medals in the 1,000m and discus. Jeremy Belcher picked up a bronze medal in the 60m hurdles. Rounding out the junior development group were 11 year old Ian Hunter with a pair of bronze medals in shot put and javelin, Katie Bos with a bronze in the 1200 for 13 year old girls and Emily Chilton cementing her dominance in the 13 year old girls’ 2,000m with a gold. In the midget age category, 15 year old Kinsey Weir picked up a bronze in the 80m hurdles and javelin. She also won silver in the pole vault. In the same age category Courtenay Vanee won silver in the javelin and Richard Wang did the same in the 2,000m. The Royal City coach/athletes followed up on their performances in Kelowna with Cristina Weir winning the 35-39 year old pole vault and Alex Bouzane doing the same in the 40-44 year old master’s category. Over the Canada Day long weekend, over a dozen Royal City athletes competed in the 2012 Jack Brow Memorial Track Meet in Kelowna. Katie Stewart-Barnett in the 9 year old 60m hurdles; David Patry-Smith in the 9 year old 60m hurdles, 1,000m, and high jump; Megan Lauener in the 10 year old 60m hurdles, 100m, high jump, and shot put; Anaiyah Bernier in the 10 year old girls 60m and long jump; Jenevieve Patry-Smith in the 11 year old shot, discus and javelin; Ryan Jensen in the 11 year old 60m hurdles, 600m, 1,000m, long jump, and javelin; Jeremy Belcher in the 60m and 100m; Jamie Lauener in the 13 year old boys 80m hurdles and javelin; Kinsey Weir in the 15 year old girls pole vault and triple jump. And, to prove that coaches are not just ex-athletes, coaches Alex Bouzane won the open men’s pole vault, Christina Weir won the open women’s pole vault, and Jason Delasalle medaled in open men’s discus. 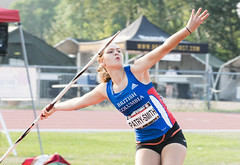 June 23rd found the Royal City Trackers squad of 28 athletes in competition at the BC JD Pentathlon Championships in South Surrey. 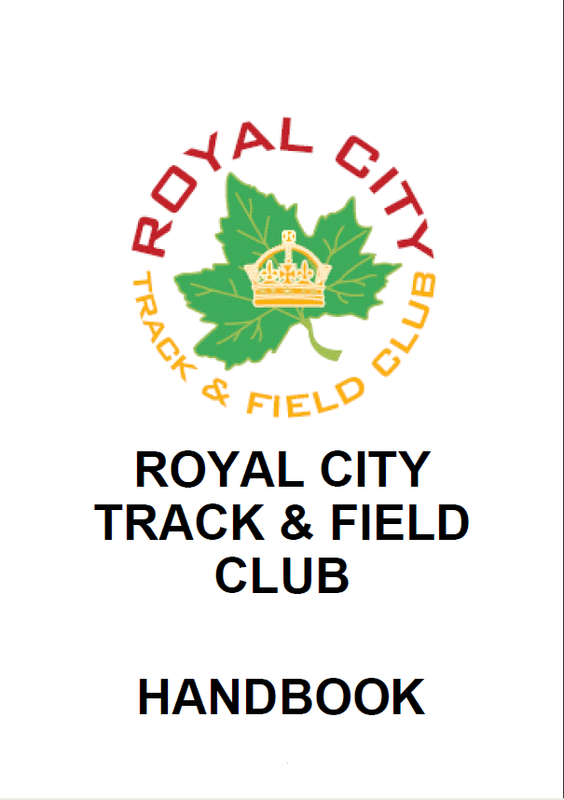 On a day where the weather started warm but finished in torrential rain, Royal City Track athletes warmed to the occasion with shining results. The club earned a total of 13 top 8 finishes in a very strong field of competitors from rival clubs from around the province. Strong performances were achieved in almost all age groups for the girls and boys with multiple PB’s achieved in events at the meet. 9 year old girls – Katie Stewart-Barnett placed 3rd with 1079 points and Alysha Sidhu 6th with 737 points. 9 year old boys – David Patry-Smith 8th place with 808 points. 10 year old girls – Megan Lauener 3rd place with 1753 points. 10 year old boys – Hamish Muttersbach 8th place with 1175 points. 11 year old girls – 11th Jenevieve Patry-Smith, 13th Shianne Lowka, 14th Emma Barnett. 11 year old boys – 5th Max Jones with 1904 points, 7th Ryan Jensen with 1712 points, 8th Jeremy Belcher 1686 points. 12 year old boys – 6th place Ian Hunter with 1847 points, 9th Emmanuel Dadson, 12th Jaimie Whittemore. 13 year old girls – 6th place Lauren Vanee with 2061 points, 7th Brianne Lowka with 2030 points, 8th Emily Chilton with 1831 points, 10th place Kathryn Bos, 11th Olivia Noort. The Pentathlon is a meet composed of 5 events; high jump, long jump, sprint hurdles, shot put and either a 600m, 800m or 1000m race depending on age. Just over a dozen Royal City Track and Field Club athletes braved some of the worst conditions ever at the Langley Pacific Open Invitational Track Meet on June 16 and 17. David Patry-Smith had top eight finishes in the 9 year old high jump and shot put. Megan Lauener and Anaiyah Bernier finished two and three in the 100m for 10 year old girls. Megan also medaled in the 60m hurdles, 600m, and the high jump. Shianne Lowka finished in the top eight in high jump and javelin for the 11 year old girls as well as medaling in the discus. Jeneviève Patry-Smith took first in the shot put and javelin in the 11 year old girl category. Maxwell Jones showed his dominance on the track by medaling in the 60m and 100m and winning the 200m in the 11 year old boys category. He also finished in the top eight in the 600m and 60m hurdles. Meanwhile his compatriot, Ryan Jensen medaled in the 60m hurldes and also had top eight finishes in the 600m. Brianna Bates finished in the top eight in the 200m hurdles for the 12 year old girls and Ian Hunter finished fourth in both the long jump and high jump for the boys. Lauren Vanee finished in the top eight for the 13 year old girls’ long jump. In the midget category, Richard Wang finished in the top eight in the 2000m.